Tradition by Excellence - A Masterpiece of craftsmanship. Made of solid Canadian Maple wood, with beautiful handmade wood carvings matched with side panel bamboo matting, fitted with genuine leather pockets. One of our most popular traditional pool tables. A traditional pool table made from solid Canadian Maple Wood, with beautiful handmade wood carvings matched with side panel bamboo matting, fitted with genuine leather billiard pockets and mother of pearl diamond shaped sights. One of our most popular traditional pool tables. 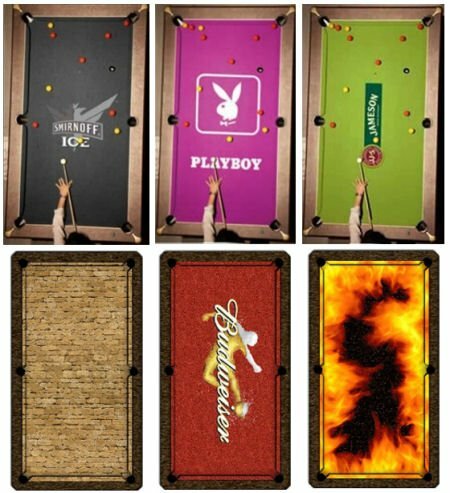 Thailand Pool Tables can offer a unique custom made cloth branding service. For an additional charge we can personalise your cloth with a logo, design, company colours or a pre-existing favourite brand - a great way to customise a table in a commercial location or business area.